People who bike over the Queensboro Bridge had to endure months without nighttime access to the bridge’s car-free path earlier this year, with ConEd infrastructure work closing off the north outer roadway. Now, after a short respite, ConEd work has resumed, and nightly closures are slated to last “through the end of the year,” according to DOT’s Facebook page for the bridge. The Queensboro path carries thousands of cyclists across the East River each day, but will be closed seven nights a week between 9 p.m. and 5 a.m. Previous closures this year started at 10 p.m. The people most affected are working cyclists on their way to work or home. 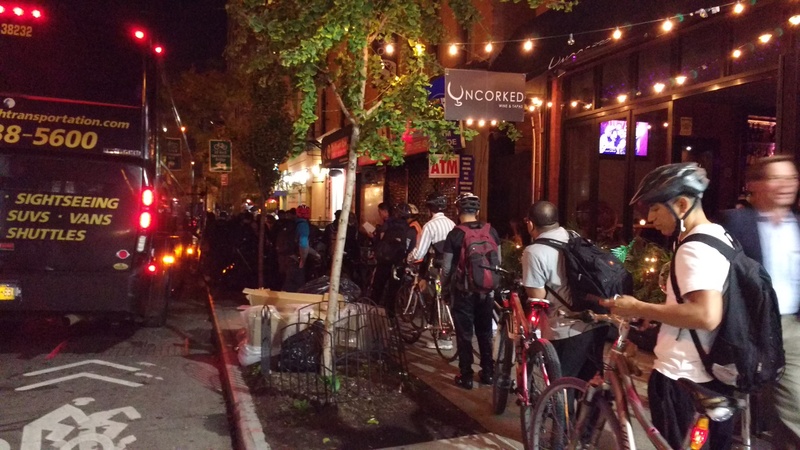 In the spring, when the closures began, activists from Transportation Alternatives’ Queens committee called on DOT to open bike access at night to the unused south outer roadway. The city didn’t act on the idea. 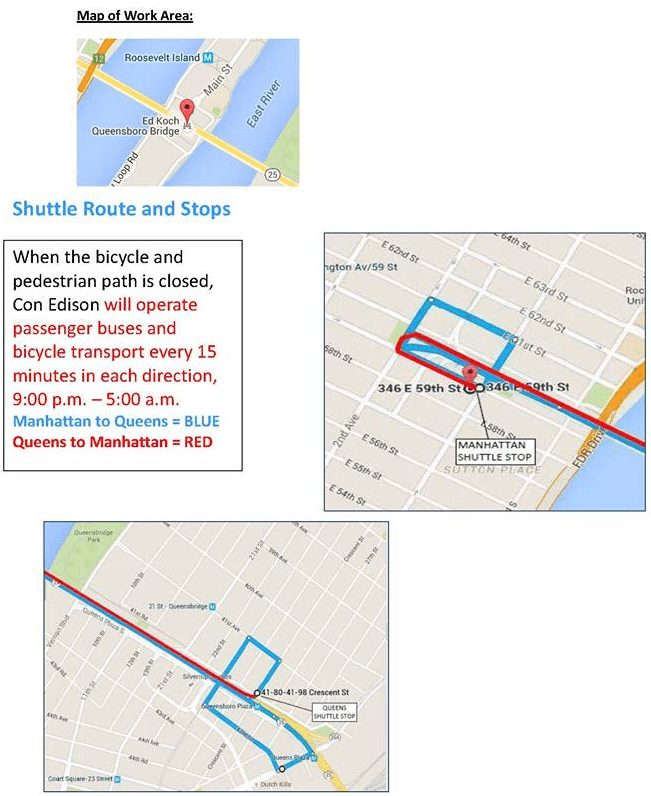 Instead, cyclists who need to get across the river can take a shuttle bus provided by ConEd every 15 minutes, or find another way home. With infrequent service and pick-up and drop-off points far from the path’s entrances, the shuttle bus is just not a viable alternative for people who bike or walk, say commenters on DOT’s most recent Facebook update. “The shuttle service is not an adequate solution for pedestrians and especially cyclists, for whom it takes about 4 times as long to get over the bridge compared to riding,” wrote Sarah Acheson. DOT closed the south outer roadway at night toward the end of 2013, following a string of fatal crashes involving drivers using that lane. Streetsblog asked DOT in April if it would consider opening the south outer roadway to cyclists and pedestrians at night, and the agency did not respond. Making the south outer roadway a permanently car-free path would provide some redundancy in the event the north outer roadway has to be closed. The north outer roadway is already cramped with biking and walking traffic at peak hours, and claiming a path on the southern side for active transportation would relieve the pressure. one population justify underserving another population? I’m saying everyone has to deal with that in this city, stop acting like cyclists are some persecuted minority when you have to deal with the sort of delay everyone else has to. When’s the last time they closed the Brooklyn Bridge to car traffic overnight, for a series of months? This before you came to NYC? How many night (or 24 hour) closings have transit riders had to deal with over the years? would preclude the use of that roadway by cyclists, at any time? Nope, but since I’m not a conspiracy theorist like you I expect there’s a reason they aren’t directing cyclists and pedestrians to an available roadway. It would be cheaper than running vans. I don’t know about the “few chose the shuttle bus” comment. I found more than can fit on one bus. Driving over the bridge at night I have seen the south outer roadway being occupied by parked trucks and it appears to be part of the work taking place simultaneously on the closed bike path. I thought it was absurd that the south roadway was not being used as an option, but now I see why. Frankly, the city should consider using the right lanes of the lower roadway for bicycles. Cars can be forced to detour to the upper roadway and the remaining lane of the lower can be maintained for trucks. The Queensboro Bridge bike/ped path has been closed from 10 p.m. to 5 a.m. for 16 of the last 24 months while ConEdison conducts electrical repair work. Currently, a six-week closure that began on May 21 is making nighttime trips especially difficult for working cyclists. Despite the regularity of the closures, DOT still hasn't worked out a reasonable alternative for people who count on overnight access to the path. How About Opening Up Another Lane on the Queensboro Bridge for Walking and Biking This Summer? The Broadway plazas debuted during Memorial Day weekend, and car-free hours in parks usually expand during the summer. Why not try out a car-free south outer roadway on the Queensboro Bridge with a summer trial? DOT is looking into ways to provide better biking and walking access across the Queensboro Bridge, where the sole car-free path has been off-limits at night for much of the past two years, says Transportation Commissioner Polly Trottenberg. Volunteers did the counts as they build a case for converting the South Outer Roadway to pedestrians and cyclists.